The East African Railways and Harbours Corporation (EAR&H) is a defunct company that operated railways and harbours in East Africa from 1948 to 1977. It was formed in 1948 for the new East African High Commission by merging the Kenya and Uganda Railways and Harbours with the Tanganyika Railway of the Tanganyika Territory. As well as running railways and harbours in the three territories it ran inland shipping services on Lake Victoria, Lake Kyoga, Lake Albert, the Victoria Nile and the Albert Nile. The Malayan Railway sold EAR&H eight metre gauge USATC S118 Class steam locomotives in 1948, and another eight in 1949. EAR&H converted them to oil fuel and numbered them 2701–2716, making them the 27 class. EAR&H allocated them to its Tabora Depot on its Tanganyika section. They entered service in 1949 and 1950, working the lines to Mwanza, Kigoma and Mpanda where their light axle loading was an advantage and their high firebox enabled them to run through seasonal flooding on the Kigoma and Mpanda branches. EAR&H built further S118 from spare parts in 1953 and numbered it 2717. EAR&H withdrew them from service in about 1965 and they were in Dar es Salaam awaiting scrapping in 1966. In 1955 and 1956 EAR&H introduced new and much more powerful steam locomotives for its Kenya and Uganda network: the 59 class Garratts. These were the mainstay of the section's heaviest traffic until they started to be withdrawn from service between 1973 and 1980. EAR&H extended the Uganda Railway from Kampala to Kasese in 1956 and thence to Arua in 1964. In 1962 it completed the northern Uganda railway from Tororo to Pakwach, thus superseding the Victoria Nile steamer service. Also in 1961 EAR&H introduced the new Lake Victoria ferry RMS Victoria. This faster vessel doubled the speed of the circular service around the lake, allowing EAR&H to increase sailings from once to twice a week. Elizabeth II designated her a Royal Mail Ship: the only EAR&H ship to receive this distinction. 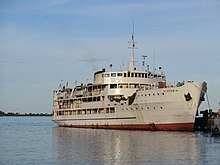 EAR&H In 1965 and 1966 introduced a train ferry service across Lake Victoria with the MV Umoja and MV Uhuru. In 1967 EAR&H made harbour improvements at Kisumu on the Kenyan shore of Lake Victoria by scuttling the disused ferry SS Winifred to form a breakwater. In 1977 the High Commission's successor, the East African Community, was dissolved and EAR&H's rail network was broken up into three national railways: Kenya Railways Corporation, Tanzania Railways Corporation and Uganda Railways Corporation. Kenyan-born singer Roger Whittaker wrote and recorded the song The Good Old EAR&H in about 1982, after a return visit to Kenya. ^ "Cambridge University Library: Royal Commonwealth Society Library, Mombasa and East African Steamers, Y30468L". Janus. Cambridge University Library. ^ Cameron, Stuart; Strathdee, Paul. "Victoria". Clyde-built Database. Retrieved 2011-05-22. ^ "Gazette Notice No 3467; East Africa Railways & Harbours; Amendments to Tariff Book No 3". Kenya Gazette. LXIII. 1961-07-18. Retrieved 2011-05-18. ^ McCrow, Malcolm. "Marine Services". East African Railways and Harbours. Malcolm McCrow. Retrieved 17 May 2011. ^ Cameron, Stuart (2004). "Umoja". Clyde-built Database. Retrieved 2011-05-17. ^ Cameron, Stuart (2004). "Uhuru". Clyde-built Database. Retrieved 2011-05-17.